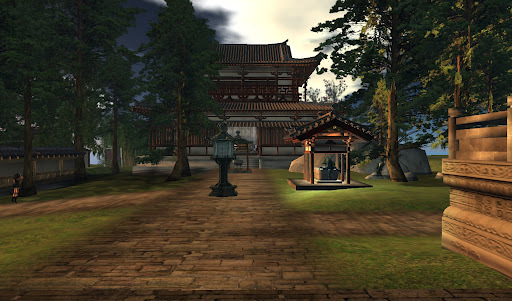 This will be my 2nd in the series on Japanese Gardens in Second Life. It begins with a return to my roots, the first place I felt the magic of Second Life, and the site of my first home. I could tell many stories about my time at Rieul but this isn’t about those days or my involvement with the Zen Retreat, this is about the Zen Retreat today. On Saturday, I tp’d into the Zen Retreat at Rieul. A lot had changed since the days when I roamed the paths and enjoyed the surroundings. Dakini Rhode was the orignal creator and much of her world remains, but now the garden is owned by Mongo McGinnis. There are really two sections of the Horyu-ji Temple owned by the Zen Retreat. They are both very unique. The original at Rieul and the temple section on Mieum. 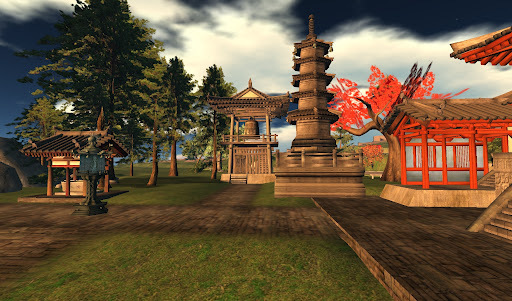 This photo essay is more a story about Buddhism in Second Life and it’s home at Rieul and Mieum, however I think there are many elements of the Japanese garden embodied in these landscapes. Here’s another view of the garden area. of Buddhism in it’s different forms. of the artistry of Ryusho Ort. the creations of this SL building genius. Down the path is the temple. a glorious statue of the Buddha. This is the end of my photo essay, but I want to say that these photos were the most difficult I’ve had to shoot in a long time. I had to set my draw distant down to 72 to hide the profound clutter and ugliness that filled the surroundings and skies. I’ll be doing a post about the surroundings on my other blog, tomorrow. I don’t want to detract from the beautiful work and stewardship of this land. These small plots of land have been here since my earliest days and the history of how this place came to be is a story to be told some day. For now, bravo to all the people who have made the Zen Retreat at Rieul and the Temple at Mieum a joy. 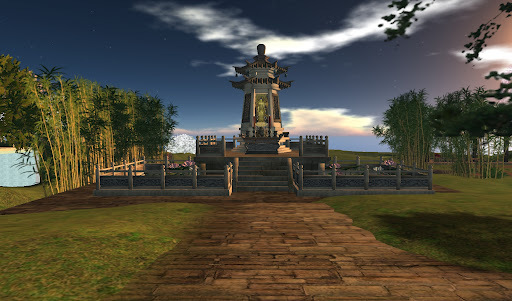 This entry was posted in Features and tagged Exploring, Photography, Second Life, Zen Gardens. Bookmark the permalink. Wow, this is such a beautiful looking plce. 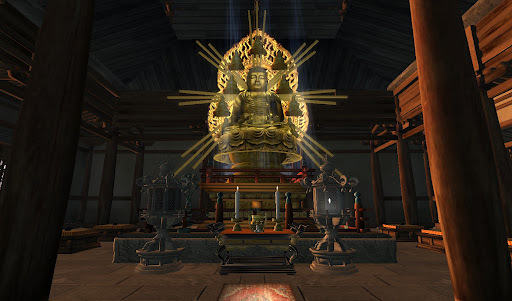 The architecture is fabulous, and I am especially wowed by your last shot of the buddha statue! What a beautiful place Yordie. You know what would be cool for the adventure group – Is to organise tours of places like these – even once a month?. Sure I can go down and wander around, but there isn't much like being led by someone who has been there. I know, another project, add it to the list of "maybe somedays"
Thank you Dahlia and Becky… I'm glad you enjoy the pics.Before the end of the week I'll be posting an article on my Notebook blog with photos where I had my draw distance set at 512m. Its a different picture. However, in Zen we find beauty were we can, so regardless the beauty survives.And that's a great idea Becky, about the tours. I love it. I want to have another chat without about an idea I have for bringing people from the real world into SL.Hugs girlfriends!